Custom Napkins gain valuable exposure whether your a taxi company or a restaurant. After every meal, you can offer your contact number at hand along with a fine print of your Company branding, logo and artwork on each of the soft tissue Custom Napkins. 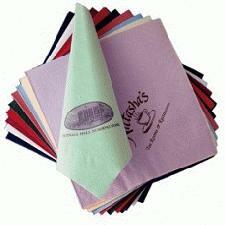 Add some panache to your corporate branding and whether your hosting a party, buffet or dinner - a sleek batch of Custom Napkins with printed branding and logo will gain valuable advertising along the way. Why not be creative? You could print a 'lipstick kiss' print along with your company branding! For a FREE QUOTE, please fill in the form regarding our Custom Napkins and we'll be able to help you.